SRINAGAR: The south Kashmir Anantnag district has lost 15 lakh apple trees to the early wet snow blanket that froze Kashmir for three days, official sources revealed. The district has suffered serious damage on 6000 hectares of orchards against the total horticulture space of 20,000 hectors. 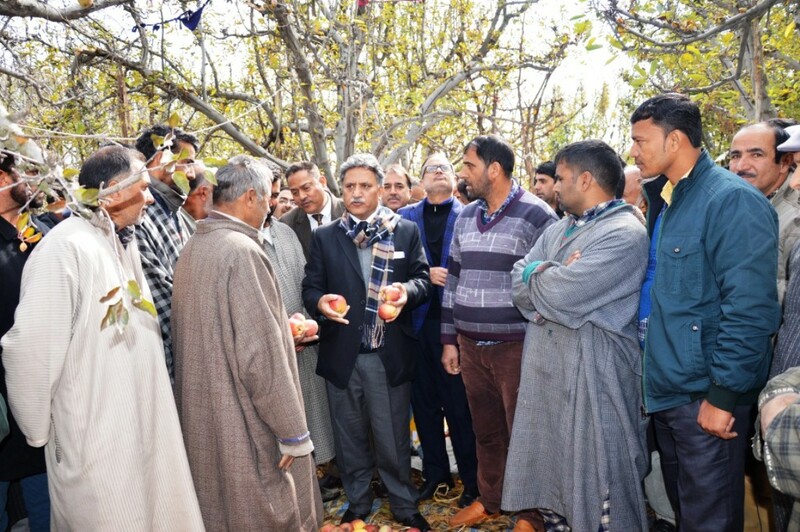 Advisor to governor Khurshid Ganai visiting apple orchard to take the stock of post snowfall damage in Anantnag on Thursday, November 8, 2018. “We have more than 71 lakh fruit-bearing trees and this assessment is quite preliminary,” Mohammad Younis Malik, the DC, later told Kashmir Life. “It will take us some more time to get the exact status of loss.” He said the youngest and the oldest trees were hardly hit. “It is not crop loss, it is a loss to the trees which is devastating to the growers,” Malik said. Advisor Ganai had gone to review the restoration of water, power supply, clearance of roads and supply of essentials commodities. The meeting took place at Dak Bungalow Khannabal, Anantnag. DC informed the Advisor about the restoration of basic services and said that there is no shortage of essential commodities in the district. The meeting was informed that at present 61349 Qtls of rice and 11060 Qtls of wheat are available at FCI Depot Mir Bazaar while as out of the allocation of 46107 Qtls rice, 20800 Qtls rice have been lifted as on date out of which 11980 Qtls of rice have been distributed. Similarly, 3076 Qtls of sugar have been distributed out of the 3137 Qtls of the allotted sugar quota. 25300 LPG cylinders have lifted out of which 17720 cylinders stand distributed. All the roads of the district have been cleared by various engineering agencies including the National Highway from Pujteng to Jawahar Tunnel, DC said. 100 % road connectivity has been restored in the district. All the health institutions are functioning normally and patients are being attended by the doctors/paramedics, ambulance service is functioning normally and the heating system has been made functional in the hospitals. He added that 80 % power supply has been restored in 25 receiving stations out of 32 receiving stations while as repairs on 132 KV Lisser line is under progress. The power supply will be restored by tomorrow, he informed. Advisor to governor Khurshid Ganai takes stock of the post-snowfall situation in Anantnag on Thursday, November 8, 2018.